Want to exhibit your work at the premier showcase for international contemporary art this December? Miami is calling. Your Final Entry Deadline is This Tuesday October 30, 2012. Entries will not be accepted after this time. 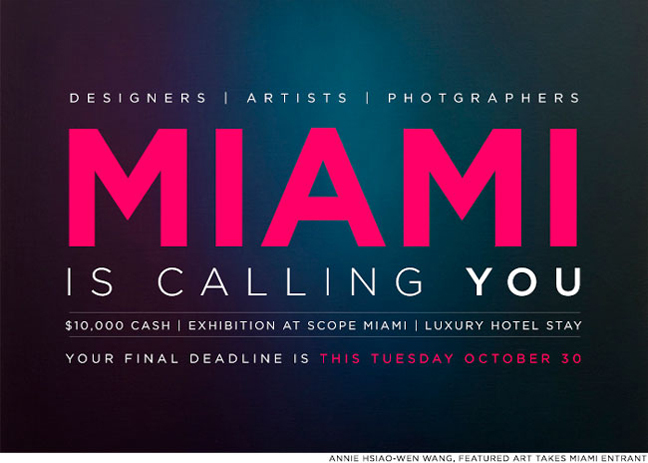 More artists will be displayed than ever before with the 1,001 Artists Project which will present select entrants in a special display at SCOPE Miami 2012. With over 50 art fairs spanning more than a decade, SCOPE has solidified its position as the premier showcase for international emerging contemporary art. Renowned for presenting the most innovative galleries, artists and curators, SCOPE Art Shows in Miami, Basel, New York, London and the Hamptons have garnered extensive critical acclaim, with sales of over $300 million and attendance of over 500,000 visitors. Want a piece of it?